Added on October 13, 2018 by michael rees. Pneumatopia reveals itself as an artistic laboratory. 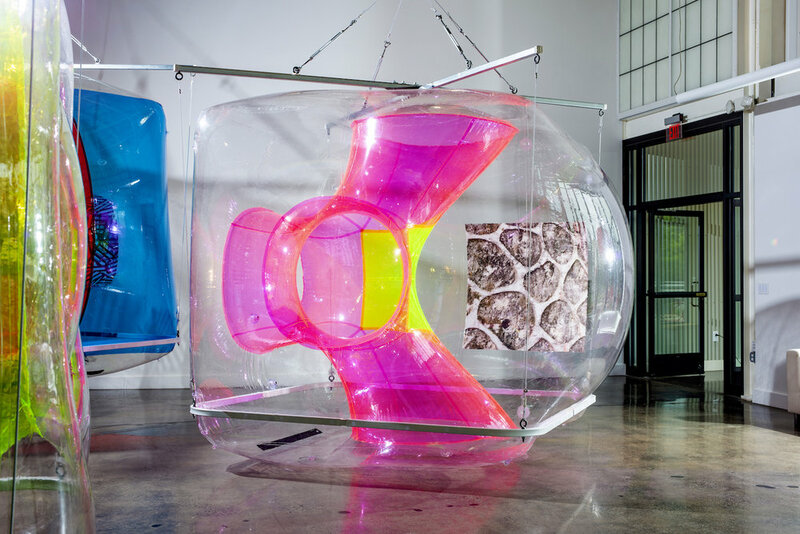 For this exhibition, Michael Rees has created in a table structures with eccentric and party fluorescent interiors that borrow from medical equipment and anatomic structures. They could equally be mistaken for equipment on a psychedelic playground or the props of a futuristic sci-fi set. Look ‘the future is there. Looking back at us [...]!’1, a paraphrased quote by Cayce Pollard, William Gibson’s female protagonist of his sci- novel Pattern Recognition comes to mind. Indeed, pattern recognition appears as one type of logic underpinning Rees’ exhibit. Moving around his installation, one immediately begins to recognize glaring patterns. As destabilizing forces, they are inscribed into the vulnerable surfaces of the inflatable vinyl and juxtaposed with vibrant color gradients mounted to the wall. Like staring right into a rainbow of richly saturated colors, these electrifying squares are deeply immersive and hyper-real. When scanned with a tablet, the dazzling patterns become passages. Pattern recognition, the mechanism of machine vision, opens up the works’ gangly physicality by superimposing them with an augmented reality. In this computable terrain, the digitally conceived simulations appear as the surrealist spawn of the inflatables’ psyche. A pig leisurely strolls up and down a stone wall, beyond any law of gravitation. A utter of butter ies interrupts the cool formal language of a cropped Sol LeWitt. A faceless clown seems to have nothing but algorithmically animated ants in his head. The viewer can interact with Rees’ ecstatic by zooming in and out of it or turning it every impossible way. As such, the artist breathes life into his pneumatic sculptures, literally and digitally. In Stoic thought, “pneuma” not only referred to “breath” but was considered to be the creative force, the vital spirit organizing both individual and universe. Like the cosmos of the Stoics, Rees’ artistic universe derives from breath but is held together by plastic and permeated by math. Conceived and modelled with 3-D software, each inflatable sculpture has emerged from a higher dimensional, mathematical terrain. In a Chinese factory, the object’s digital plasticity has then been translated into plastic reality. There is a strange similarity between Rees’ two preferred materials: the properties of code and vinyl, arguably a type of “soft” ware as well. Both are fragile substances, yet used to make enduring structures. They can be brittle, yet are infinitely malleable. They appear immaterial at times, yet their impacts can be both astonishingly and frighteningly material. Unconcerned by material contradictions, plastic and code can oscillate between states. They are the ‘pneumatopian’ material par excellence for they can be sculpted, modeled and molded into any imagined shape. It is thus not surprising that American post-war culture expressed its fantasies preferably in plastic or code. intense investigation of information technology. Within this “plastic” framework, artists and architects such as Les Levine, Haus-Rucker-Co, Paolo Soleri or Buckminster Fuller negotiated utopian ideas of technology arising from military-funded research during the Cold War as socially progressive and capable of expanding human potential beyond a pure military use. The aura, assembled by Cold War technologies, Avant-Garde art practices, and plastic Utopianism, is immanent within Rees’ Pneumatopia. As early as 1987, the artist incorporated digital technology in his practice to produce objects emerging from the hybrid interfaces of virtual and actual space. His kinetic, inhaling and exhaling Breathing Sculptures (1984-87) or the 3-D printed Anja Spine (1998) with ears protruding from it, share the anatomic references with his most recent objects. They equally transcend the familiar structures of bodies towards the intuitive and surreal, for instance a faceless clown or an agravic pig. Yet, Rees’ augmented sculptures are symptomatic of a timespan which has signi cantly changed through the comprehensive impact of the digital. A novel understanding of the object manifests itself here, one that expands itself beyond physical boundaries, is active, productive, eccentric and ecstatic. Do we interact with the work, or does the work rather interact with us? Where does the object begin? Where does the subject end? In their blurring of boundaries between subject and object, these works share a proximity with Graham Harman’s Object-Oriented Ontology.2 In his version of Speculative Realism, the American philosopher targets Kant’s privileging of epistemology over ontology through an insistence upon “the independence of the world, and of things in the world, from our own conceptualizations of them.”3 Harman argues that the world contains a multitude of agential objects and concludes that none of them, including humans, has access to any other object in a privileged way. The gesture of object-oriented philosophy is one that does not allow for the impersonal world to remain the eternally excluded “other” of human existence. Rather, it makes it, just like Rees’ objects, into something that we can interact with, question, explore, and continually revise. It is in Pneumatopia’s augmented and plastic reality that the utopian promises of the past collide with recent projections of our contemporary. There is something deeply comedic and yet tragic inscribed into Rees’ objects, most evident in their plastic materiality. Like cosmic wormholes, Rees’ air filled sculptures thus out t spacetime. Revealingly in 1969, perhaps after visiting Ant Farm’s giant blow up snake, Heidegger remarked that sculpture must be conceived as an “embodiment of places”.4 Indeed, in their supple fragility and almost immaterial grace, Rees’ sculptures preserve and embody an invisible place. It is a blank which holds something free, a dwelling for us in the midst of politically daunting events. Perhaps it is here, air-suspended by pure breath, where creative forces abide and thus our futures reside? 1 William Gibson, Pattern Recognition (London: Penguin, 2011), 57. 2 See Harman, Graham, Tool-Being: Heidegger and the Metaphysics of Objects. (Peru/Illinois: Open Court, 2002). 3 Steven Shaviro, ‘Spekulativer Realismus für Anfänger’ in Texte zur Kunst (March, 2014), pp. 41-51, here p. 44. In Kritik der reinen Vernunft (1781). Kant argues that we know the world exclusively through the lter of our own minds-through a compulsory correlation of structurally separable subjects and objects. In Cartesian logic, this means that we must never talk about the things we encounter in the world but only about the process of how we encounter them, see Immanuel Kant, Kritik der reinen Vernunft (1781), ed. Jens Timmermann (Hamburg: Meiner Verlag, 1998). 4 Martin Heidegger, Art and Space (1969), trans. Charles H. Seibert, https://pd ibrary. les.wordpress.com/2008/02/art-and-space.pdf, 3-8, p.7.